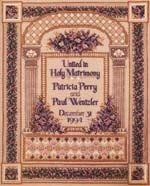 Model size: 10.5" x 8.75"
Description: An unusual wedding announcement design incorporating architectural elements along with numerous specialty stitches, rayon floss and beads. An over-one alphabet in shades of blue is provided for the lettering, and the design is surrounded by a ribbon-laced foliage border. The central portion of the design can be used to decorate a ring-bearer's pillow. Background Information: This piece was designed in response to numerous requests for a wedding announcement. I decided to make the design a bit more "masculine" than "feminine" (for lack of better terms! ): thus the incorporation of architectural elements: columns, an arch, a substantial border with block corners, and a strong, almost chiseled alphabet. There are delicate patterns, and flowers, too (of course), but I gave them a purely decorative role, allowing the stronger elements of the design to dominate. The design isn't really a sampler, but does feature several specialty stitches. Stitching Comments: This design is a challenge to stitch in that the border is quite involved (translation: lots of quarter stitches! ), and it is required that you center the names and date by using the over-one alphabet (which in itself is a challenge to stitch over-one, especially on the higher count linens). But, if you give yourself plenty of time, you should be able, without too much trouble, to stitch this piece for a some special couple's big day!